101102 - Boys up too early and they were grumpy... I saw them off to school and took Grant to school. Back to home and chained to the desk. We all had dinner and then Doc showed up and mowed the leaves. 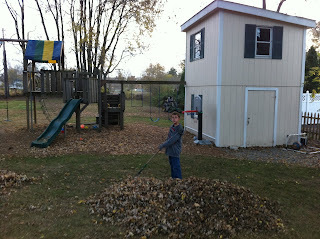 The boys and I headed out and raked some of the leaves into a pile to jump into and had a blast. D even got on his leaf costume and the boys played hide and seek. L and I up late watching a movie and watching the election results.